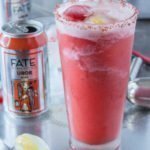 Here is a summer cocktail that features craft beer not once, but twice. Plus tequila. 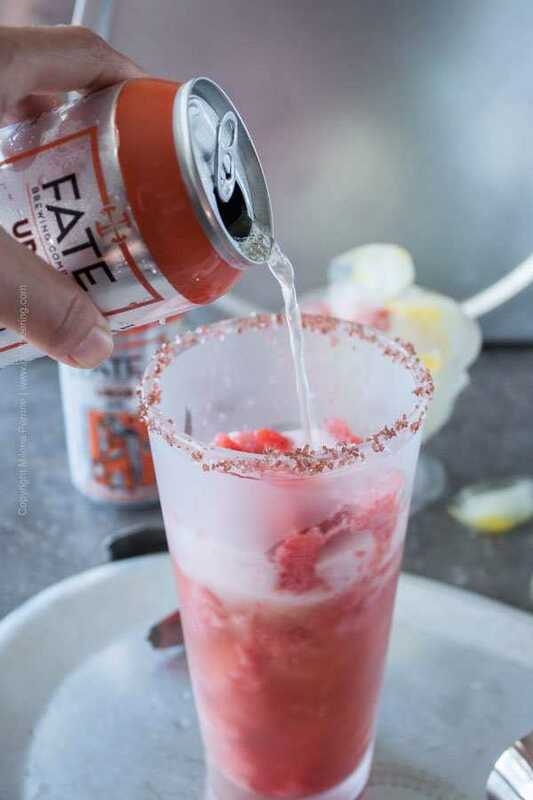 A frozen, blonde ale strawberry sorbet gose margarita. With pink salt. How is that for a mouthful? Let’s simplify. You don’t have to double down on the beer. You can use any sorbet (sans bière will work just fine:) and add any gose ale and silver tequila. That’s it. We had a few extra pints of our Summer Blonde Ale Strawberry Sorbet. It happens when you make a batch three weeks in a row:). I couldn’t just ignore it every time I opened the freezer. And I don’t even want to begin telling you how hot it has been lately. The condensation on the outside of the glass shows it. Thank goodness for the frequent summer rains this year, otherwise our town would have been in flames. Eventually my neurons fired up and generated the idea of a frozen margarita along the lines of fruity and slightly sweet, but also sour and salty. You know that I am not a fan of overly sweet beverages. I hit the jackpot with this craft beer cocktail, I really did. 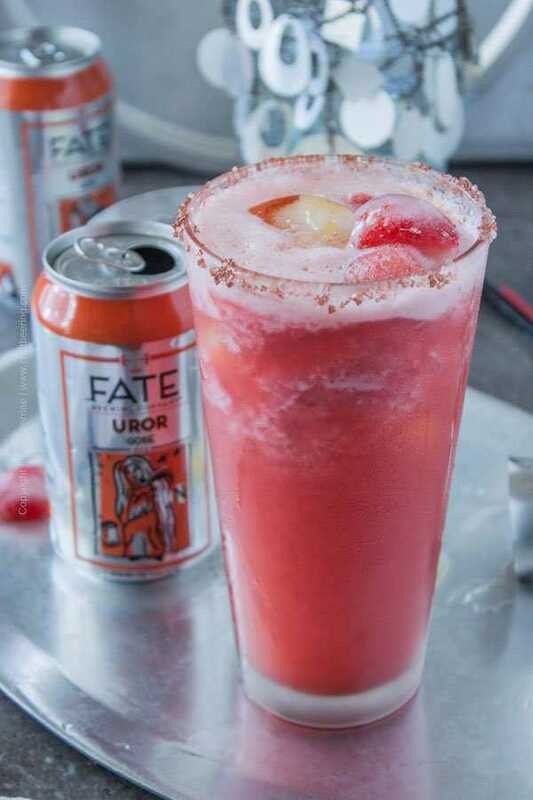 The Uror Gose is brewed by the talented and fun people at Fate Brewing Company in Boulder, Colorado. We used to go to the taproom almost weekly all winter long during the year our son was four and was learning to ski in the nearby Eldora. Besides the stellar and always evolving craft beer collection, they have a very attractive food menu which was an added bonus for Chris and I. Why eat the overpriced fast food at the Eldora lodges when in half an hour we could be at Fate’s taproom? They also make a version of the same wheat ale that is tequila barrel aged. If we get a hold of that one here soon, I am definitely going to make a sorbet gose margarita with it. Just imagine oak and agave flavors joining in the blend of sour, sweet, salty and fruity. Ever since I made jalapeno and lime ice cubes this past spring, I’ve been making ice cubes with pieces of fruit in them, so for this drink I threw in a couple of lemon and strawberry ones. Looked pretty if nothing else:) For the rim I used Hawaiian Alaea sea salt, another great (as well as mineral rich) option is Himalayan pink salt. Pour pink salt in a shallow dish/plate. Moisten the rim of each glass with lemon wedge and dip into salt. Place a few scoops of sorbet in each glass. Add 1.5 oz of tequila to each glass. Tilt glass and pour Gose over sorbet slowly as it will foam. Stir well, add ice cubes and enjoy (a straw is most helpful). This sounds SO delicious! I’m new to beer cocktails, but I can’t wait to give it a try! Love the emphasis on delicious craft beer too. We are saving it to Pinterest and will try it soon. Also, beautiful pics! Thank you Emily for stopping by! Your words are like music to our ears:) Just checked you guys out. Nice work! Thank you Marilyn! Stoked to hear! 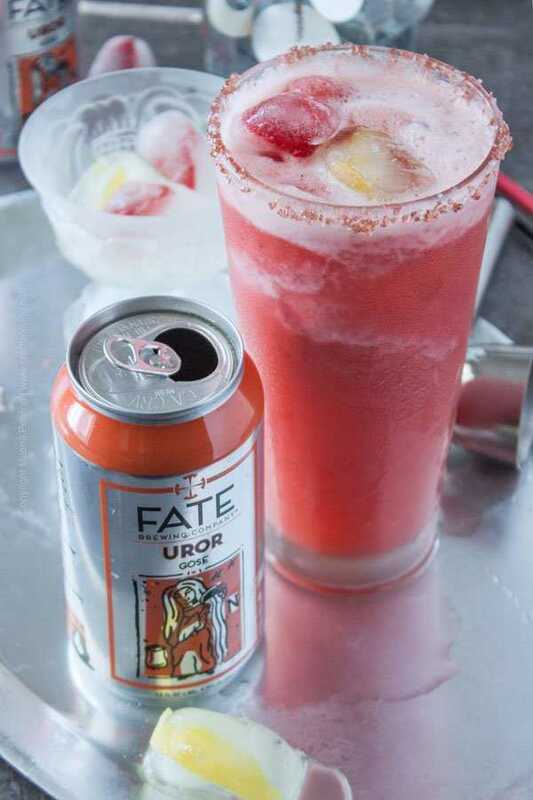 I am not sure how you made a beer beverage look so pretty. I will introduce my hubs to your blog and let him check it out. I am sure he is going to love this. Than youk- Ill take three please. Thank you so much Karen! It is really refreshing, we vouch for it:) Thank you so much for stopping by. Mmmm! This looks so good! Do you have any recommendations for those of us who aren’t into sours? (I know, I know…I just can’t seem to find the right one) Thanks so much for sharing at the #happynowlinkup! I guess so! 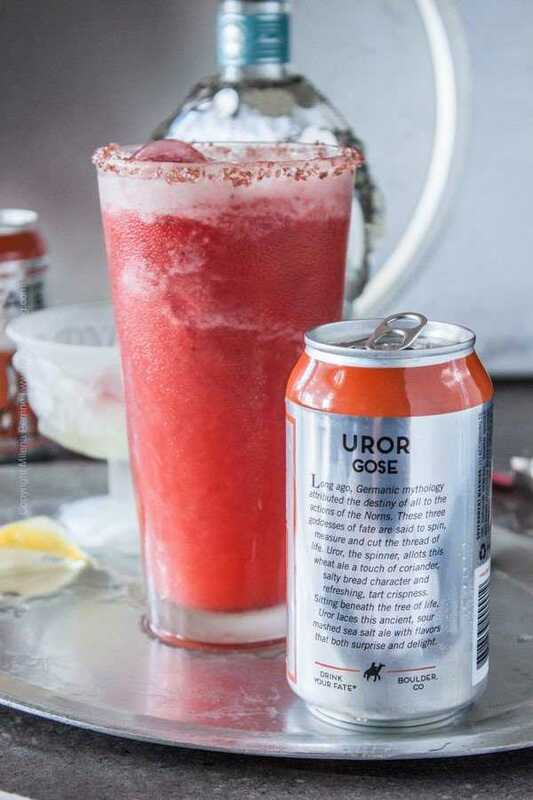 If I weren’t using a gose (which I picked for the combo of sour and hint of salty) I would make this sorbet margarita with a Kolsch syle ale, or Helles or Pilsner, even a blonde ale would be great. wait what? you can make margaritas with beer? am i behind the times here or something? this looks fantastic! what a great idea! I haven’t found a margarita I didn’t like. Ever since I started following your blog I’ve been experimenting with beer in many different ways. Messily a sorbet goes margarita is my the next beer cocktail. You defiantly hit the jackpot with this one. So glad to read this Mary! Keeping fingers crossed to win you completely over on craft beer’s side… But, yes – so easy to take your sorbet, add the tequila and beer and suddenly you are all set! No need to clean up a blender, lol. You have piqued my curiosity with this one and I hope to be able to find Uror Gose in my area. Also, your pictures are fantastic! Hi Sandra, good news:) Maybe a new Gose fan in the making? Any traditional gose style beer will bring the same flavors to the mix. They are quite popular, bigger liquor stores usually stock several options. I’m dying over here. This has to be the best margarita I’ve ever heard of! And it’s pink! AKA, the most delicious drink color in existence :). We’re having people over this weekend so I’m totally going to try this! Have a lovely week, Milena. This looks SO refreshing, Milena!!! Plus, let’s just talk about the colour – how pretty?! This is like a two for one deal – dessert and drink all in one. I’ll drink one as ‘dessert’ and a second as a ‘drink’….hehehe. And that salt rim? High five! Love that! Hope you guys have a fantastic week 🙂 Cheers! Thank you Dawn, pink drinks are always well loved, aren’t they? I agree – this margarita can be had in lieu of dessert, no problem there!